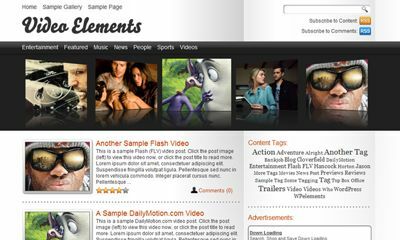 Video Elements is a commercial WordPress theme designed for video sites. Video Elements lets you your videos in two different ways, including the â€œInstant Viewâ€ which allows users to instantly view any video on your site by selecting the video thumbnail, and within the single post page where the video is featured above your post description. The Video Elements theme has been tested on WordPress versions 2.3 and 2.5 only. The theme has been testedÂ with FireFox, IE6.0, IE7.0, Safari and Opera. A license is $25, and requires that you leave a credit link in the foter. Great theme for the price.